caption: A man who gets things done. caption: Ole`s only concern that day -- Sully`s Hill? caption: How to save gas money: Method 1.
caption: who needs an suv! caption: look ma, I can finally spin my tires! 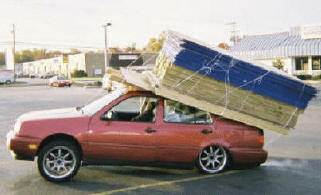 caption: Isn't that too much car for your load to carry? caption: Ew! Go do that in a bedroom!!!!!!!!!!!!!!!!! caption: Look mom no brain!!! awww man, the spare tire is in the trunk?? Hope them are not Firestones? And now for Plan "B"
$20.00 for delivery? I'll do it myself! $20.00 for delivery, I'll do it myself! I always wanted a low rider! That is Why Real Men Drive Trucks! Ivan becomes the newest victim of "space junk"
I think I'll need to make a smaller ice house! Geesh I thought my fishhouse would be lightweight? Ma, We've finally got the materials for our new Ice Shack! ...and now to lower the front end. Scott, what were you thinking?